Can a dress code prevent ethnic conflict? 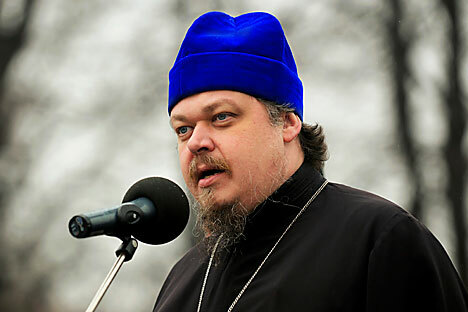 A high-ranking Russian Orthodox priest says that women can solve Russia's ethnic problems by dressing more modestly. The subject of miniskirts came up unexpectedly during a discussion of interethnic relations in Russia. December, as you may recall, saw ethnic clashes between Russians and men from the Caucasus in several major cities. Just across from the Kremlin in Moscow, thousands of soccer fans poured out onto Manege Square to demand justice in the murder of one of their own. A Russian soccer fan was killed after a group of Russians and a group of men from the Caucasus got into a fight over who had the right to get into a taxi that had pulled up. So woman in miniskirts in this case had absolutely nothing to with the violence. I might also add that Russian soccer fans developed their own particular dress code years ago. They all dress and look more or less alike. But, back to the women. It is indeed a fact that Russian girls and women like to underscore their merits (as well as their shortcomings) with their clothes. Tripping down icy winter sidewalks in short skirts and spike heels, that’s our style. Lying on the beach in diamonds and make up, nothing could be simpler! And of course we dress for the office as if we were going to a dinner party. Russian women like to draw attention to themselves. Perhaps this is why today their praises are sung far and wide — and not just in Russia. Foreigners who live in Russia or come here regularly realize of course that not all Russian women look and dress so enticingly. Recently, an opposing tendency has been in evidence: some women seem to want to appear as inconspicuous as possible. Walk down any busy street in Moscow and you will see that the most common form of dress for women is jeans, to the sincere regret of many Russian men. Moreover, serious companies in Russia are increasingly instituting strict dress codes for the work place. These codes regulate not only the height of one’s heels and the length of one’s skirt but the color of one’s nail polish and the kind of hairstyle — no flirtatious stray locks! But the strictest dress code of all is that of the Russian Orthodox Church. Walk in during a service and you will see that most of the women are dressed alike: in a long dark skirt, shapeless blouse and head scarf. According to Olga Kurova, an expert on Orthodox culture, this modest style of dress originated 300 years ago under Peter the Great. His reforms, aimed at subordinating the church to the state, provoked a schism in the church as well as the emergence of a church culture with its special uniform. This emphatically dowdy, almost beggarly, way of dressing became a sort of protest against a fusion of secular and religious. Now that is has become trendy to go to church, neophytes have assumed this outward appearance as a true sign of “holiness.” The result is rather strange: if in other countries, including Orthodox countries like Greece, attending church is a reason to don the most expensive and beautiful clothes, in Russia the opposite holds true. And if some unenlightened woman walks into church in pants with her head uncovered, she will be looked at askance or even reprimanded, not necessarily by the priest, but by the parishioners. Once upon a time, of course, a woman wearing pants was taken as a challenge to society and as the demonstration of a sinful nature. But today, as Olga Kurova rightly points out, no sensible person would think of calling a woman in trousers a man. Time sets everything straight. In the early 1990s, raspberry jackets suddenly became de rigueur for the Russian nouveaux riches. Today these jackets exist, but only in jokes. A girl dressed in an overly provocative fashion on a Moscow street, at least during the day, elicits only laughter — she’s obviously from the provinces. And since every girl who comes to Moscow from the provinces wants only to blend in, she soon jettisons her flashy daytime dress. To be fair, many priests in the Orthodox Church have accepted contemporary styles of dress as a given and are not trying to do anything about it. After all, the Soviet regime also tried forcibly to make everyone alike. And how those efforts ended for the regime, we all know.